Slip-ups on dirt tracks and perilously deep muddy ruts will always be part of adventure travels. Would it not be great if your luggage can deal with all that! With the cooperation and advice of seasoned adventure riders, we created the ATG Overlander soft luggage. We designed these bags to be durable and 100% waterproof for the most adventurous and aggressive riders around. 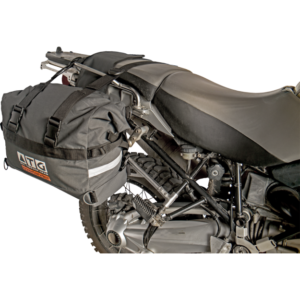 The ATG motorcycle Saddle-Bags are the right choice for adventure addicts, be it a weekend away or riding a demanding trip in a constant downpour. Designed with simplicity and durability in mind, the outer shell provides all the protection against branches, accidents or whatever the demands of your trip. The inner bags keep the gear 100% waterproof, dust-proof, sand-proof, mud-proof, storm-proof and safe to IP66 rating. Built tough: Combined with PU coated Oxford weave fabric and rubber construction it offers a very high degree of tear and abrasion resistance. The outer shell is water resistant with double stitched seams. Impact resistant HDPE plastic is used on the underside, front and back of the panniers to protect the contents of the bags against rocks, branches and in case of accidents or spills. The same plastic is used on the backside of the panniers for support and to ensure the bags keep their shape. Functional design: The cross over support straps is unique to our bags. They pull the bags up and compress the bags to the motorcycle. 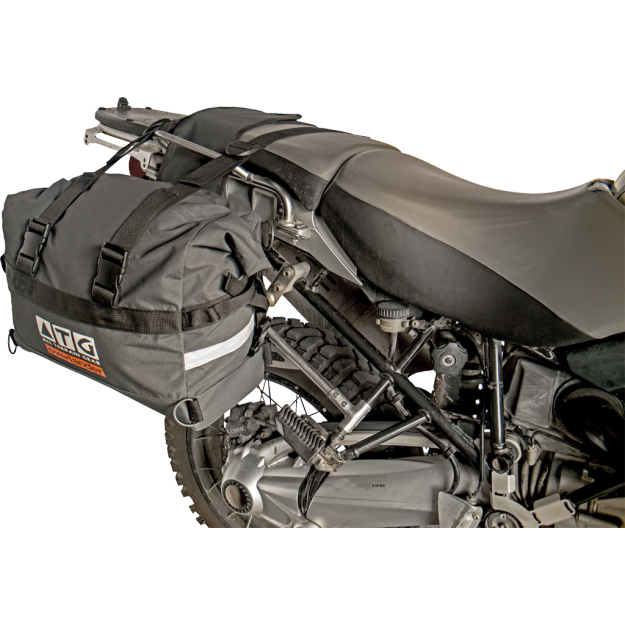 Unlike other soft panniers, the straps eliminate the tendency to sway into the rear wheel of the motorcycle. The straps keep the bike narrow and the weight close to the center. 100% Removable inner bags with carry harnesses included. The inner bags can also double as washing bags or cooler bags or carry bags when staying for an extended time at one spot. One wide seat support strap with Velcro to secure the bags over the motorcycle allows for a pillion to still ride comfortably. Due to their bigger attachment area to the bags they will bear the occasional overloading of the bags. These bags have no zipps that will break due to stress or dust. Reliable protection: The inner bags are made from tough PVC fabric. Your gear will stay 100% dry and dust free to IP66. Leave the outer bags on the motorcycle and only remove the inner bags when needed. You do not have to remove and cart your panniers to a tent for protection or when in need of items. Lets face it rain covers are rubbish. No need for special rain covers that tear at high speeds or blow off the luggage or disappear. Must be at least 10cm away from the exhaust or exhaust gases. The 6 steel D-rings will not break when you do have a small off. Most soft panniers use plastic D-rings to secure the bags to the motorcycle and eventually do break due to use. ATG Overlander bags can be repaired by anybody with a sewing needle and twine in any place around the world. No need for welding or special tools to fix a metal panniers, broken buckle or torn bag. We know our bags will be used by aggressive riders and accidents and damage will always be part of the course. At last you do not have to throw your bags away due to cuts or tears. Just replace or repair what is needed. Dimensions: 41cm length, 20cm width, 40cm high. Note: All outdoor products age and wear with tough use. Treat your gear with care.